Jeremy Thiel: Fun to be Fit! 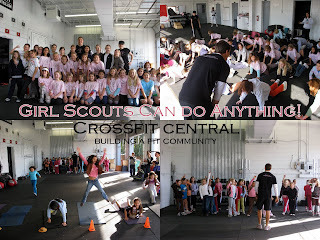 Girl Scouts from all over the city came to Crossfit Central this past weekend for Crossfit Chicks! Young ladies from 6 - 10 years old were out in full force. Therin Smith and I hosted three groups 900am 1030am and 12pm. Each group participated in a dynamic warm up and placed in groups of 6 7 for Crossfit Kids Relays!